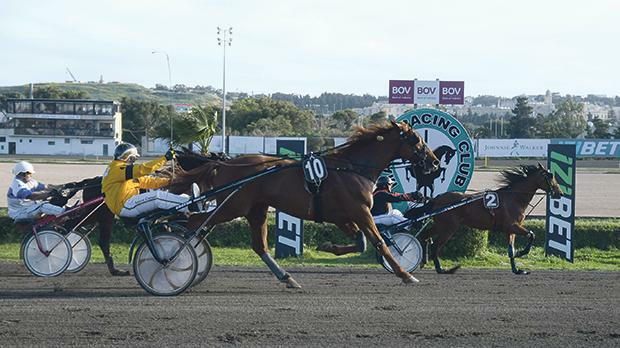 The 12th meeting of the season made up of seven races all for trotters was held yesterday afternoon at the Marsa Racetrack. The programme had to include also a race reserved for flat horses on a short distance of 1250m, but this event had to be cancelled after that one of the four runners was scratched few hours before the start of the programme. Meanwhile, five of the trotting races heralded the start of the St Francis Cup for class Copper trotters on a short distance of 2140m. The programme included also a class Premier race on the same distance, won by Titan De Begadan and Michael Mifsud. Sixteen trotters lined up for the class Premier race. French Titan De Begadan (Michael Mifsud) led all the way and triumphed by half length from Unrefundable (Anton Cassar). Troll (Andrew Farrugia) and Team Monceau (Marco Debono) also obtained a good placing. This was Mifsud’s trotter first win in Malta in an average time of 1.17.6” per kilometer. In the class Copper heats, twenty horses made it for the semifinal stage. In the first heat, Christmas Corse (Redent Magro) stormed ahead midway through the final straight. The French trotter sealed its first win in Malta easily by a length and a half from Crown Lady (Dylan Baldacchino) and Saxo La Chesnaie (Mario Falzon). The early leader of the second heat, Devil Somolli (Rodney Gatt), was outsmarted by Freddie Melon (Charlton Gauci) midway through the final straight. For Freddie Melon this was its first win of the season. In the third class Copper heat, Brio De Malte (Michael Axisa) dashed strongly from the outside during the last 600m and managed to gain its second win of the year from French veteran Petrus Du Vivier (Chris Cassar). Tasco (Shaun Portelli) registered its first win in Malta in the fourth heat from the same championship. This French trotter managed to do so after staving off the challenge of Clarito (Alex Cortis) in the final metres. There was a keen duel between Duc d’Haufor (Redent Magro) and Runway (Alan Barun) in the final straight of the fifth and last class Copper heat. It was the former which cruised to its first win of the year. For Redent Magro this was the second win of the day. Another meeting at the Marsa Racetrack will be held on Saturday. The first race should start at 1.30pm.